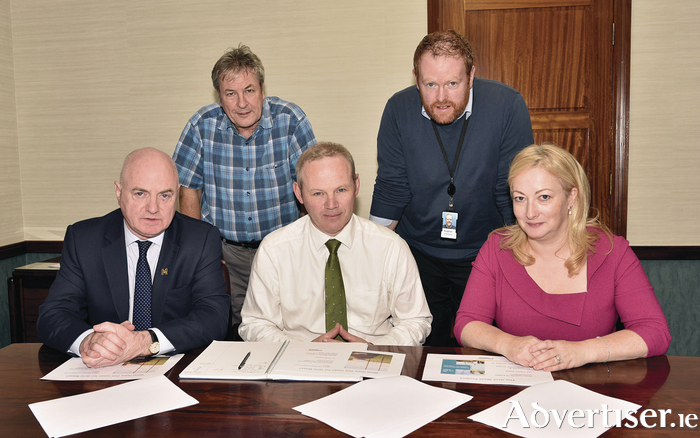 Pictured meeting in Aras an Contae were front row: Peter Hynes (chief executive of Mayo County Council), John Fitzgerald (Eirgrid, director of grid development), Rosemary Steen (director of external affairs, Eirgrid). Back row: Iain Douglas (head of planning, Mayo County Council), and Eoghan O'Sullivan (community liaison officer, Eirgrid). Photo: Ken Wright. EirGrid, Ireland’s electricity grid operator, last Friday announced plans to replace the Grid West electricity transmission project with a smaller-scale development. The Grid West project was proposed in 2012 to connect large amounts of renewable energy to the grid. The decision to replace it was made due to the lower than expected amounts of wind generation in the north Connacht region. This means renewable generation can now be connected through the development of a lower voltage, 110 kV line carried on poles; not the 220 kV or 400 kV schemes previously proposed under Grid West. EirGrid is continuing technical studies on the project and over the coming months will engage with landowners, communities, and stakeholders in the region. Those affected by the new proposal will have an opportunity to influence the decisions EirGrid makes. However, The Moy Valley Protection Group condemned the latest announcement from Eirgrid regarding the Grid West Line. In a statement it said: "None of the groups representing the affected communities and landowners were contacted before the latest plan was announced nor were they given any opportunity to give their views on this plan before it was announced in a press conference yesterday. In addition none of the groups representing the affected communities and landowners were invited to the press conference nor were they given any prior notice that it was to occur." They continued: "In their announcement Eirgrid have even been disingenuous about why Grid West was proposed in the first place. It was put in place specifically to transport the power from Phase 2 of the Oweninney Wind Farm and the whole of the Cluddaun Wind Farm. Neither of these developments were given planning permission by An Bord Pleanala so as a result there should be absolutely no need for Grid West."